While not very old, fantasy sports may have been around longer than you realize. Years ago, the genre was known as rotisserie, or roto. It wasn't until fantasy sporting leagues joined the likes of ESPN and professional leagues (NFL, MLB, NBA) that fantasy sports were re branded and took off into the stratosphere. The is a sporting genre wherein a member of a league will assemble a roster via a draft. Said roster players operate on a points-based system, accumulating points for positive plays. The better a player's performance, the more points are awarded to the fantasy owner. The more points accumulated by the fantasy owner, the better his or her odds of winning become. Fantasy sports have become so popular, in fact, that some big-name websites are paying out literally millions of dollars every single week through guaranteed tournaments. And since these fantasy sites primarily operate by taking a rake, rather than clearing the losers' money into their coffers, the average person does have a positive net in the genre. While it might be low, around $7, the fact is that fantasy is literally a sport where everyone can win money. Is Playing Daily Fantasy Sports Leagues Actually Legal In The US? https://www.legalbettingonline.com/ will do what we can to simplify fantasy sports for you, and to offer you information on the betting structures, roster layouts, and even giving you tips to help you succeed in your league. But our number-one goal, as our name suggests, is to speak to the legality of fantasy sports and let you know that it's 100% legal to play this type of sports in the United States. To put a very simple answer on it: Yes, fantasy sports are considered legal. In fact, the biggest fantasy sites on the planet are operated on US soil, and they operate in full view of the law, with a slew of commercials on cable networks. There are two main reasons for this. Reason one: Fantasy sports were not banned by sports betting laws such as the Federal Wire Act of 1961, PASPA in 1992, or by the UIGEA in 2006. So there are no real regulations against fantasy. Secondly, the act of drafting a roster and formulating a team in this fashion is not considered to be a game of chance but rather that of skill. So there is no real reason for any regulation to come about to block fantasy sports, at least not yet. Should that regulation unfortunately rear its ugly head, you will hear about it from us. Draftkings is one of 2 giant fantasy sites that are operate legally from within the United States. They accept players from all but 5 US states and offer all new players a 100% matching bonus up to $600 free. They offer a millionaire maker tournament every single week where first place takes down a cool million bucks. Why not you? Fantasy sports operate like a well-oiled machine, and it all starts with a self-contained league system. For instance, let's say that you and seven of your friends want to create an NFL league in fantasy. You will start by compiling your teams and naming your teams. After this, you will have a draft, where you will pick players for your team until which point all spots are filled up. After the spots have been filled, you will be pitted against other owners (league members) to see which fantasy owner can accumulate the most points after the games are played for the NFL. Of course, the records will be compiled over the course of a few matches. For example, a league with 8 teams may end up having a 4-team playoff, with the two winners of each branch facing off against one another to see which fantasy owner wins the big prize. On big-name sites, these prizes can be upwards of a million dollars or more, but understand that these leagues are typically a lot larger, and they are much harder to compete in, as you will be squaring off against people we play fantasy sports and take them very seriously. Fantasy pros, so to speak, and they are hard to defeat. Why Playing Fantasy Sports Leagues Is Not Considered "Gambling"
45 of 50 states in the USA allow for skill-based gambling, no matter what that gambling is. So long as it can be said to rely on skill, then it is legal. To put it very succinctly, fantasy sports are considered to be based on skill, not based on chance. Now, of course, many people want to debate this point, with one side saying that it's every bit as lucky as roulette, and the other side saying it takes skill like a game of billiards. This is a debate we are not going to enter at Legal Betting Online. We won't hide it; we're very happy and excited that fantasy sports are legal in the US. But as for whether we hold them to be luck-based or skill-based, well, you can make that argument whichever way you feel. All we do know is that, as anti-gambling as the federal government of the USA is, they still consider fantasy to be skill-based. Now, maybe this has something to do with leagues like the NFL and MLB and NBA fully supporting fantasy. Or maybe politicians simply do not know anything about gambling and thus take the word of people who tell them that it's skill since there is a draft involved. Whatever the actual reasons, citizens of the USA are allowed to legally sign up and play fantasy online in every state save Vermont, Washington, Arizona, Iowa and Missouri. These are the only five states where even skill-based games are considered a no-no. Will that change? If it does, you will read all about it here. The Debate Wages On: Will Fantasy Sports Always Be Considered Skillful? Behind the scenes right now, you do have anti-gambling advocates lobbying hard to do away with fantasy sports as legal gambling. Most of these people are the ones who fall down on the side of PASPA (the Professional and Amateur Sports Protection Act of 1992) and claim that it's all about "protecting" things: The athletes, the integrity of the sports, the children, the citizens, etc. As one can imagine, these same arguments have been made all throughout history. We're positive that during the Prohibition Era, there were people arguing against alcohol because of protection and children and morality. So understand that fantasy sports are constantly under attack. Now, is this attack big enough to cause actual waves, or will it just make some ripples? For right now, we're only looking at ripples. The government has no plans, no agenda, to reverse its ruling that fantasy sports are skill-based. In the event this changes and someone starts forcing legislation through the pipeline, we will warn our readers and let them know that they should be ready to (a) get their money out and (b) hit up an offshore site. For right not, however, fantasy sports are still considered a game of skill, and not only is the genre legal but it is growing tremendously. If there is a sport out there that is popular, you can probably find some element of fantasy offered, whereby you can join a league, pick a team in a draft, and compete against other league owners. To that end, there are literally dozens of different fantasy sports available out there. However, since these fantasy leagues operate on a season-long system, staying intact for as long as the sport runs, we are only going to go into any real detail about the most popular in the USA today. As you can see below, these are the big-four American sports, and add in some Esports with the explosion of the gaming genre over the past couple of years. The biggest of them all, fantasy football basically covers the NFL but can technically extend to the NCAA men's D1 football division as well. In NFL fantasy football, players enter into a draft and select members of teams to fill their rosters. These roster sports include: 1 quarterback, 2 running backs, 2 wide receivers, 1 flex player (offensive: TE, WR, RB), 1 tight end, 1 placekicker, 1 defense/special teams squad, and six bench players. Yards accumulated, catches, touchdowns, field goals, extra points, interceptions, and other positive plays all accumulate points for your roster. If you score the most points, you win. Fantasy baseball deals primarily with Major League Baseball (MLB) and very similar to football, you are drafting players to your roster in hopes of accumulating enough points. The player with the most points wins. In baseball, you can choose a roster of 26 players (25+1 DL). You can split this up between pitchers and hitters, typically using 9 pitchers, 13 batters, 3 bench players, and 1 DL (disabled list) player. A pitcher's ERA counts here, as in the earned runs they give up. Singles, doubles, home runs, RBIs, walks, hit batters, and other stats also count to the score total. Like the sports before it, of course, fantasy basketball also operates on a points system. Though since so many points are scored on a court, other things also taken into consideration and weighed heavily include blocks, steals, assists, and other positive plays on offense and defense. Generally speaking, your fantasy basketball roster will have 10 players: 1 point guard, 1 shooting guard, 1 guard (P or SG), 1 small forward, 1 power forward, 1 forward (PF or SF), 2 centers, and typically 3 utility players (any position). While hockey might not be as popular as football or basketball, it still has quite the large fantasy niche. In fantasy hockey, goalies are probably the most valuable players. Their saves and blocks and other statistical categories are weighted very heavily, as hockey is generally a low-scoring game and it's rare players will have goals scored as points. Your roster here will include 2 centers, 2 left wings, 2 right wings, 4 defensemen, 2 goaltenders (goalies), and 6 bench players. When drafting, be aware if you have a keeper league, a snake league, an auction system, etc. Each variation will have a different sort of draft. In fantasy Esports, it's all about the game you're playing specifically. For instance, drafting a roster for a League of Legends tournament will have different positions and spots than drafting players for a Starcraft 2 roster. Some of the roster positions you can expect to see are tops, junglers, mids, AD carries, support players, flex players, entire teams, and alternate players who will sub for starters. Points here are scored on straight wins, frags accumulated, the time it takes to play, assists, and kill variations such as a triple kill, a creep kill, etc. However, keep in mind that these things will vary depending on which Esport you're playing. Head to Head leagues – these leagues pit you, a fantasy owner, against one other fantasy owner in a heads-up match. If your team scores the most points, you win. Odds say you will face a new team each week in such a match-up. Total Point leagues – in this type of league, you're not playing any set game or match per se, but rather you are going off of the points you accumulate over a set time: A season, a few games, a tournament, etc. All-Play leagues – with this type of league, every team plays the other team each week. In an 8-team league, for instance, all teams play one another, and the highest point totals advance until thorough enough records to name a winner have been accumulated. Keeper leagues – these leagues actually allow fantasy owners to keep their players. So rather than drafting year on year, you keep your players with your team, letting go and signing new players as you need. Salary Cap leagues – with these leagues, you have a salary cap that cannot exceed X dollars. Of course, this is a way by which fantasy sports look to add more realism to the genre. Auction leagues – another popular league type, an auction league forces you to purchase your drafted players auction-style, and you will get a set dollar amount before the draft starts so you can bid. Dynastic leagues – in a dynasty league, you will keep veteran players while going through rookie drafts, like a farm system in baseball or preseason in football. Similar to a keeper league, a dynasty league still allows you to draft. Two-QB leagues – specific to only fantasy football, this league lets you get two quarterbacks and thus gives you the option to play either one on a week by week basis. Empire leagues – played in a dynasty system, the first year in this league is when a portion of the proceeds are set aside. This money is set aside every year, until one owner wins back-to-back titles. Upon winning a second consecutive title, the "empire pot" goes to that owner. SuperFlex leagues – a SuperFlex league is where a QB can start in the flex position, and obviously this is another league type specific to fantasy football. Daily fantasy sports – the most popular league type today, offered by the likes of FanDuel and DraftKings, one-day leagues still use drafts, and still use a points-based system. Though rather then being locked into your roster for a full season, you are drafting new players every time you enter into a match/tournament. Rotisserie leagues – the classic of all classics, a "roto" league is where a rotisserie scoring system is used to accumulate points. In this league, scoring works by an entire team's batting average, total home runs, total RBIs, total bases stolen, total team wins, and other statistical criteria. You have probably seem the commercials all over TV, but is it really true? Can you really win big bucks with online fantasy sites? The facts are overwhelming. 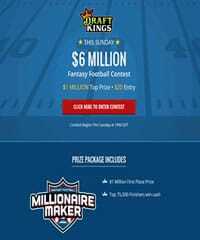 While you will undoubtedly need a whole lot of skill, and also a truck-full of luck, you can technically win $1 million or even more on a fantasy site like DraftKings today. The money is so real, and the buzz is so loud, in fact, that from Disney to Fox News, huge international corporations are getting in on the action as sponsors. Now, we can sit here at Legal Betting Online and sing the praises of fantasy, telling you about its legality and how lucrative it can possibly be. But who are we? Though when you follow the money and see that these huge corporations are in on it, including the sporting leagues themselves like the NFL and NBA, you start to realize that fantasy sports are legit in America. These sites don't play. If you can draft the right teams, you can win big bucks. The majority of these big-dollar pots work with daily fantasy leagues, which we spoke about above. Upon entering the precise tournament you want, e.g. the $1 million big daddy, you will see who you're going up against. You then get to draft your team and see how well you do. Though there are so many people here that you will play in more a March Madness style of bracket, having to re-draft players and win through every level. Though this is far from your only option. At these big-name sites, you can enter into tournaments for less, or even go heads-up with people, and still you can win some serious money. Check back with our website in the near future. We will have plenty of tips and tricks you can use to chase after that big money. For right now, just rest assured that online fantasy gambling is perfectly legal, and the money you win is yours to keep. One other thing to keep in mind if you signup with any of the USA sports betting sites we recommend is that the more research you do in fantasy will definitely help you out with your sports wagering. I've found myself really starting to know a lot about the players, their stats, how teams fair against the run ect... all which help me make better decisions when it comes to capping the games. Below are a couple of website that I personally frequent every week to stay up to date on my fantasy players. Staying up to date with whether or not players are injured, game time decisions ect.. is a crucial part of being successful in your leagues. There are also many subscription services that help you optimize your lineups and offer incredible historical stats on every player. We will review and list those websites in the near future once we get a better hold on which are the top rated services. ESPN Fantasy Website - This is a great overall resource to keep up with fantasy related news. NFL.com Fantasy Website - Another great resource for NFL fantasy enthusiasts.